SANTA BARBARA — Participants in the Santa Barbara Clean Sweep event, now in its sixth year, are used to seeing strange things emerge from the harbor depths — ranging from plastic chairs blown off a dock to a bicycle stuck in the mud on the seafloor. “Depending on the area we’re cleaning in the harbor, we can find lobster traps, cable, bicycles, dock carts, barbecues, even steering wheels,” said Mick Kronman, Santa Barbara’s harbor operations manager. This year, volunteer divers will be working on fingers E through H at Santa Barbara’s Marina One. They will be removing seafloor debris, which later will be hauled to a dumpster. Over the years, more than 18,000 pounds of trash and debris has been removed from the harbor floor during Santa Barbara Clean Sweep, with around 3,000 pounds coming up each year. Over the years, many boaters have volunteered to help out in the cleanup effort, lugging away in trash carts the items brought to the surface by the dive team. 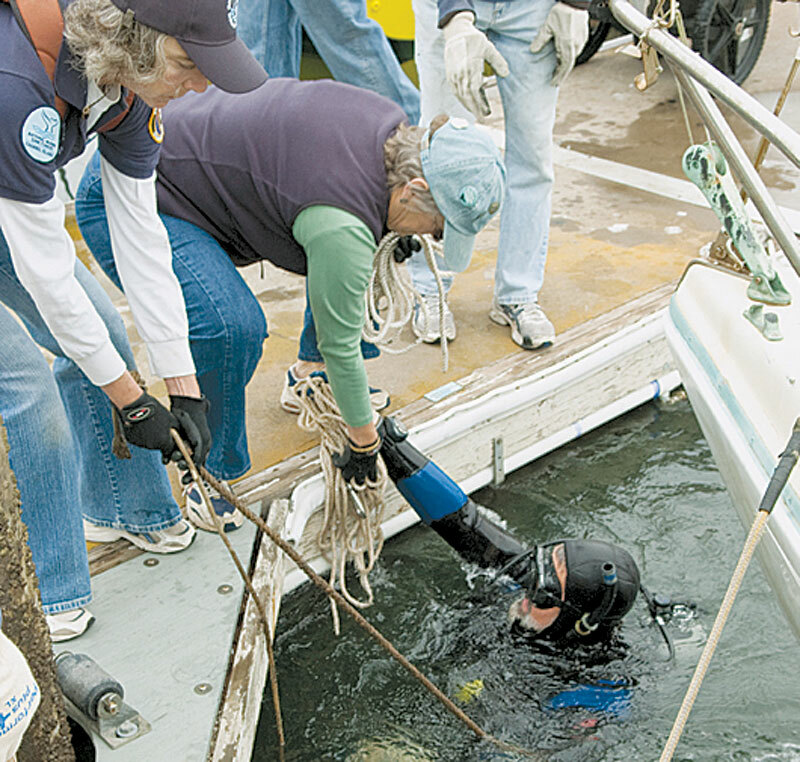 Santa Barbara’s Waterfront Department utilizes a professional diving company for the cleanup, along with volunteer professional divers from NOAA and Channel Keeper. Kronman, who implemented the program in Santa Barbara Harbor, said he believes Clean Sweep’s systematic approach to cleaning different portions of the harbor for each event will lead to a consistent approach to keeping the harbor clean. The event is scheduled to begin at 8 a.m. Volunteers will assemble at the Travelift Pier near the Santa Barbara Harbor Patrol boats. Coffee, doughnuts and water will be provided to volunteers at the start of the event, followed by a sack lunch at the end. If you want to participate as a dockside volunteer, call Brian Slagle, waterfront administrative analyst, at (805) 897-1962.